Riemann was born into an impoverished family in Germany, a devoutly Christian son of a Lutheran pastor. He was homeschooled by his father with the help of the local schoolmaster, and was sent to attend a prominent school (Johanneum at Luneburg) at the age of 16. Riemann quickly became bored with the math class and asked the director for more advanced material. The director gave him most advanced math books (including Leonhard Euler's works and Adrien Marie Legendre's Theory of Numbers). Riemann mastered them in merely a few days. He decided to study theology at the University of Göttingen in 1846, but switched to mathematics - not because of a disdain of theology and philosophy, but in recognition where his greatest talents laid. Grundlagen für eine allgemeine Theorie der Functionen einer veränderlichen complexen Grösse (1851). This paper covers the scope of what is commonly taught in a college complex analysis course today, and sets forth the Riemann Mapping Theorem. Uber die Hypothesen, welche der Geometrie zu Grunde liegen (1854). This paper discusses manifold, curvature, the Riemann curvature tensor, and the Riemann metric. This work lays the mathematical foundation for the General Theory of Relativity a half-century earlier. This paper established Riemannian geometry. Theorie der Abel'schen Functionen (1857). Called one of the finest mathematical works ever, this paper discusses Riemann Surfaces and moduli spaces, touches on modern topology, and explains the Riemann-Roch theorem and the Riemann-Hurwitz formula. Ueber die Anzahl der Primzahlen unter einer gegebenen Grösse -- in English, "On the Number of Primes Less Than a Given Magnitude" (1859). The Riemann hypothesis, which is the greatest unsolved problem in mathematics today, is in this paper. Riemann created a new type of geometry, which became modern differential geometry. Riemannian geometry then became the basis for new theories in physics in the 20th century. Most of the theorems of Riemannian geometry are different from their counterparts in Euclidian geometry. For example, the sum of the angles in a triangle in Riemannian geometry is greater than 180 degrees, which is the sum in Euclidian geometry. Also, there are no parallel lines in Riemannian geometry. Riemann hypothesis remains the greatest unsolved problem in mathematics today. It was first proposed in Riemann's classic paper On the Number of Primes Less Than a Given Magnitude (1859). It is defined as the sum of infinitesimal segments of the x-axis of the area under the function on a graph, between f(a) and f(b). The Riemann Integral is the one commonly taught in school and continues to be the most useful definition for scientific purposes. The more complex Lebesgue Integral is used today in some mathematical fields. Riemann helped develop the Cauchy-Riemann equations, which are a set of partial differential equations for a complex-valued function such that it is holomorphic (complex differentiable) if and only if the equations are satisfied. 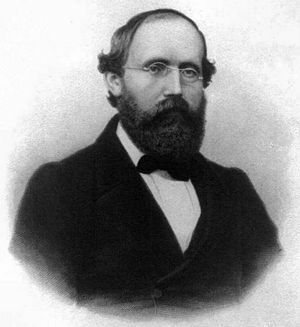 A long list of concepts central to mathematics today are named after Riemann. They include, among many others, the Riemann integral, the Riemann series theorem, the Riemann-Roch theorem, the Riemann-Lebesgue lemma, the Riemann surface, the Riemann sphere, the Riemann localization principle, and the Riemann mapping theorem. ↑ For example, even in the entry on Wikipedia, an encyclopedia generally biased against Christians, which contains a List of important publications in mathematics, Riemann is referenced 20 times, compared to only 14 references to Euler, 10 references to Gauss, and only 7 references to David Hilbert. ↑ Mathematician Hetu Chakra explained that "Bernhard Riemann is arguably the founder of modern mathematics. ... In a fairer world, this guy would be as celebrated as Newton or Einstein." See footnote 6, infra. ↑ E.T. Bell, "Men of Mathematics," 484 (1937). This page was last modified on 5 August 2018, at 21:30.